Deb's Cup of Tea: It's actually quite pleasant outside. When I awoke, it was -12. This does not bode well for another day of digging out. I'm wearing 2 pair of socks, 2 pair of pants, a tee shirt, a heavy sweater and my Iowa Hawkeye jacket. I managed to get a thin pair of gloves inside the other pair. The hard part is keeping the ear muffs over the ears. Today, I tried an Iowa Hawkeyes stocking cap. That seemed to work. 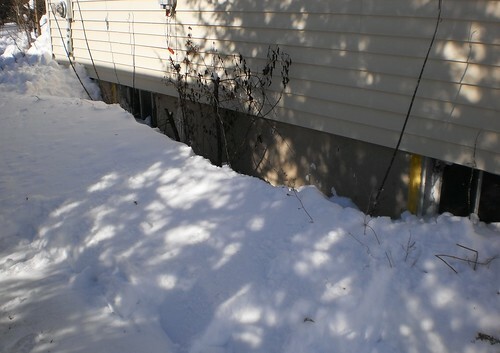 The task this morning was to get from the Jeep past the southeast corner of the house. This is the view. 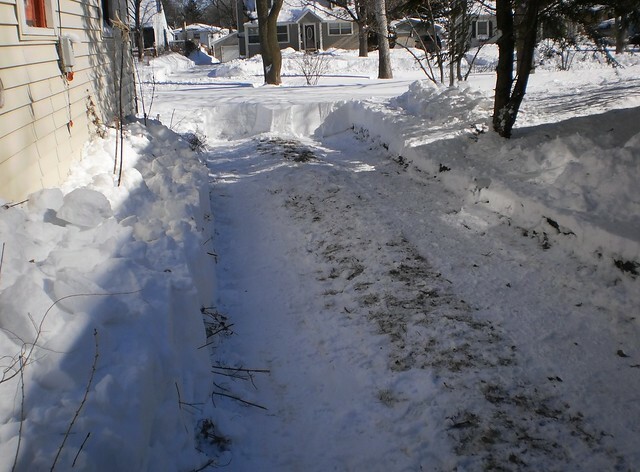 This is going to be the easiest shoveling as the snow isn't as deep here. As I worked east, I discovered it was only a foot deep in some places. There was a 2 foot drift next to the house. That was going to take a bit of work. This is interesting snow. It's perfect for chopping into blocks to build a snow fort. 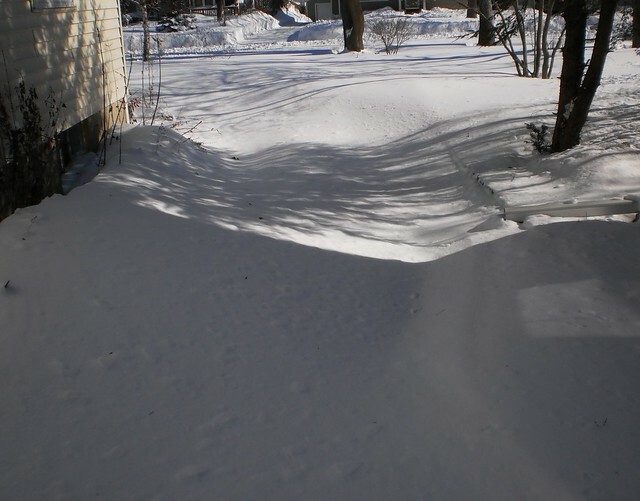 You would start with a drift like the one across my front yard. 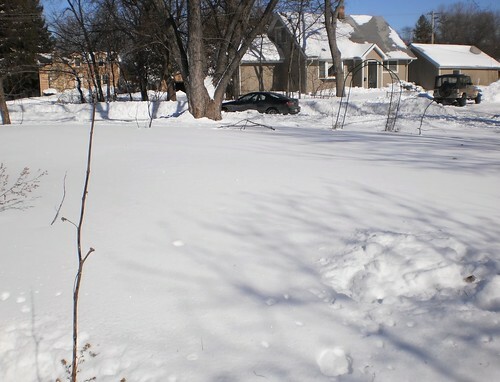 Once you've hollowed out a circle, you can easily cut this snow into blocks. It just sort of falls that way anyway. I shave off a chunk, cut it into blocks, then scoop and toss. It will stack easily and stay stacked. Some people will take a hose and hose down the sides of the fort once it's built. But that's only appropriate if the neighbor kids built one, too. I'm kind of tempted to build a fort or part of one once I head toward the front door. It's really nice outside. It's warmed up to 14 degrees and there's little to no wind. If there was still a gale out there, this would be completely miserable. I had to come in after 2 hours because my feet get cold. I'm wearing heavy socks but they still get cold. One of my neighbors came by and said his snow blower died yesterday. He and another neighbor are going to look at it tonight and he hopes they can fix it so he can come over tomorrow and help. I got farther than I planned. I need to clean litter boxes so I might not make it back out, but I am encouraged. 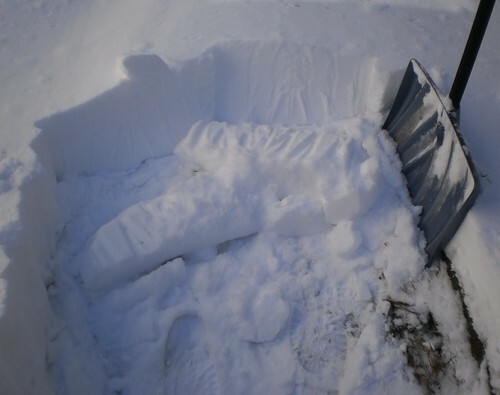 Even if the neighbor can't get his blower going, it's not that hard to shovel. It might take me all weekend but I can do this.